Sorry for being out of touch, however, the internet in Death Valley is pretty much non-existant. We just finished our tour there with our very special guest instructor, Chuck Kimmerle. As my faithful blog readers know, I’m a huge fan of Chuck’s work, so it was a treat to finally meet him in person. I’m sure many are thinking, so what kind of guy is Chuck? Well, let me put it this way, on day two of our scouting, I heard him tell his wife in a phone conversation something like this… “so you know the immature childish jokes you think are stupid and don’t like? Well I’m with two guys who are more childish than me. You would hate it here but I’m having fun” I took great offense as it was abundantly clear that Chuck is so much more childish than Dan and I. Needless to say, Chuck was a blast to be with. He did portfolio reviews for those who brought images (prints). He lead two lectures about Black & White image making as well as processing. His knowledge of composition, image design and the subsequent toning in post processing is tremendous and all went away with pearls of wisdom. I hope Chuck will want to work with Dan and I in the future, however, I’m a bit concerned after our spending 9 days together. He might be having second thoughts…. The blog image was made on our scouting day to the Dunes. Keep in mind this was processed on my laptop, I’ll check when I get home today and to see if I need to adjust on a calibrated display. Hopefully, Chuck will approve! Stay tuned for a few more Death Valley images in the week to come. 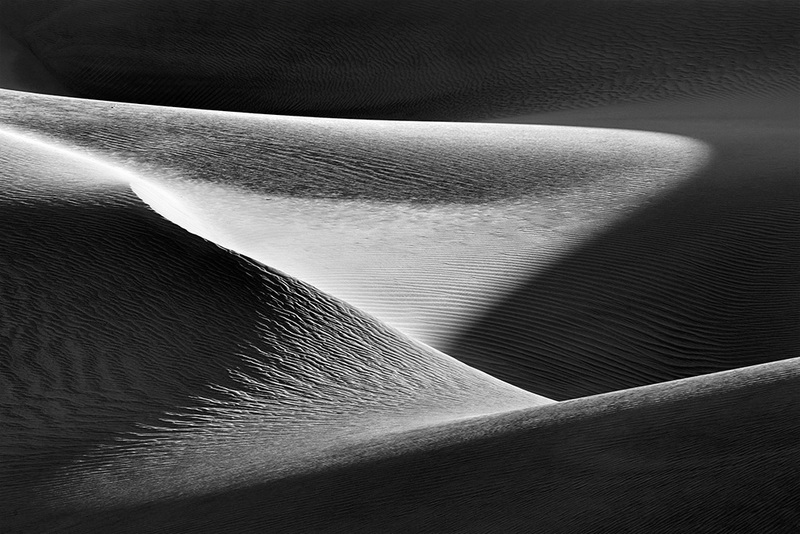 Oh and the title is a reference to Peter Lik and Chuck’s excellent impression of him. Update – I tweaked the image a bit since getting home and working on a calibrated monitor. Outstanding John! Love the curves! It’s a good start, John. A good start. Crap, I didn’t get anything like that :-). Awesome workshop JB, Dan and Chuck. Thanks Arthur. It was great having you along! I’ll give you a wow, hope you will be sharing some of that new knowledge. More childish then you an Dan, don’t think so. Wow John a winning shot. Sounds like a great time, looking forward to seeing many more wonderful scenes. Thanks Ferrell. It was a good trip. This is really beautiful, John. I love the tones and wonderful shadows. It was great to meet you while we were out there and I look forward to seeing more of your photos from your trip! It was great to meet you, Ron and Danny. I hope your trip was a big success! The composition, motion and flow are amazing… As like wondering within Death Valley, this image provides an artistic adventure… Masterfully seen, captured and processed. Print this one BIG and hang it proudly in your gallery … and other galleries. As a final note: Prior to seeing Death Valley, I assumed the meaning of the word “death” … Yet, Death Valley is very much alive and offers so much more. I was pleasantly impressed that with the hundreds of footprints that are found at the end of the day, they all are erased for the next day for those to experience DVNP as if they were the first to have ever set foot onto the dunes. Magical gifts – to say the least! Wonderful interplay between the rhythym & flow of the light/shadow & ripples/textures in the sand. Clearly a “wow” image. Hey Dale!! I resemble that comment! Great to see you here on the blog bud.